Orbital sanders, also known as ‘finishing sanders’, are any type of sander that has a fixed vibrating sanding plate. These are the most common type of sander available. They come in a variety of different styles/shapes including rectangles, squares and pointed bases to easily get into corners. – This sander scrubs the surface of the wood, moving its base plate in small orbits to give a very fine, scratch-free surface finish. An orbital finishing sander is the most forgiving of all power sanders. Models like this one from Ridgid are lightweight, easy to control and relatively quiet. It’s also virtually impossible to damage the surface with this type of sander. Orbital sanders are sometimes called quarter-sheet sanders because they accept one-quarter of a sheet of standard 9 x 11-in. sandpaper. The tool uses two spring-loaded clamps to hold the sandpaper against its flat, square pad. In use, the pad vibrates in tiny circles–or orbits–allowing you to move in any direction, including across the woodgrain. Because the orbital is so tame, it is not useful for heavy stock removal. On the other hand, it is ideal for ultrasmooth sanding and for knocking down dried coats of paint or varnish. There are two specialty sanders that use orbital action: First there’s the contour or profile sander, which comes with several interchangeable rubber pads of various shapes and sizes. This tool is designed for sanding moldings, carvings and other small, intricately shaped surfaces. The second specialty orbital sander is the detail sander. 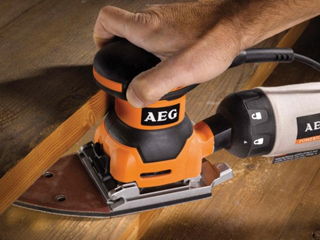 It has a triangular or pointed pad that permits sanding in corners and other tight areas. – Do not press your weight on the tool; let the sand paper do the work.